Today during the newest edition of Sound Bites, our series about our food and our world, we begin with a look at environmental legislation that will be addressed in the 2016 Maryland General Assembly, in our Countdown to the Annapolis Summit. Joining us will be Dru Schmidt-Perkins, President of 1000 Friends of Maryland; and Mitch Jones, Senior Policy Advocate at Food and Water Watch. We close out Sound Bites with a special tribute to the life and work of renowned cultural anthropologist Dr. Sidney Mintz, known as the Father of Food Anthropology. 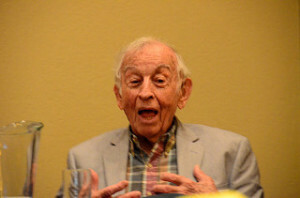 Mr. Mintz died on December 27, 2015 at the age of 93. Celebrating his life and work is Sarah Hill, Associate Professor of Environmental and Sustainability Studies at Western Michigan University and author of the Boston Review article “The Sweet Life of Sidney Mintz;” Kevin A. Yelvington, Professor of Anthropology at the University of South Florida; Richard Wilk, Distinguished Professor of Anthropology at Indiana University and Jane Guyer, George Armstrong Kelly Professor of Anthropology at Johns Hopkins University.